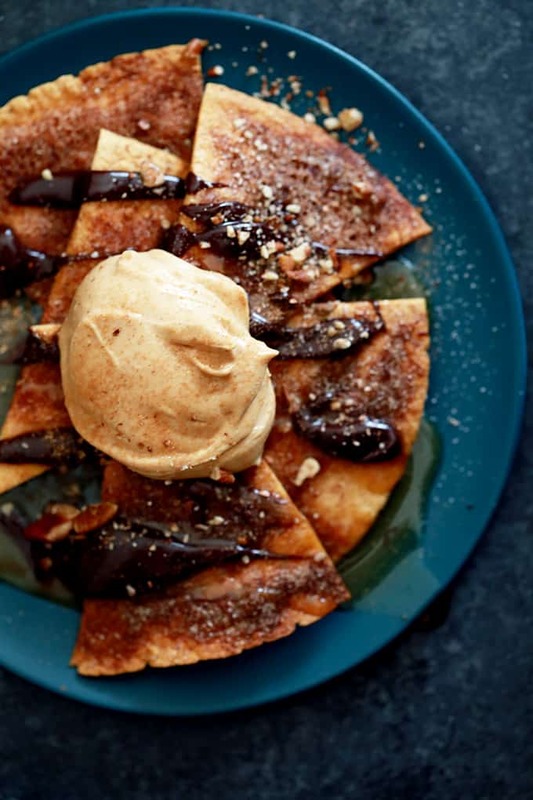 These Turtle Churro Nachos are the perfect dessert to feed a crowd. 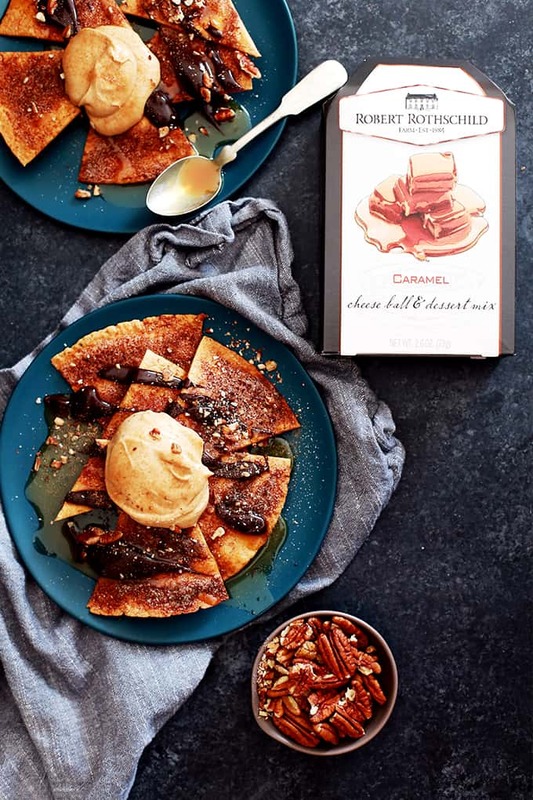 Homemade cinnamon and sugar speckled tortilla chips are drizzled with caramel sauce and chocolate ganache before being crowned with a dollop of caramel cream cheese. They’re then sprinkled with chopped pecans and additional cinnamon sugar. I had to do a double take when I looked at my calendar last week and saw that April was quickly drawing to a close. Even though Spring is playing a cruel joke on us here in Colorado with freezing temps and snow in the forecast – WHAT?!?! 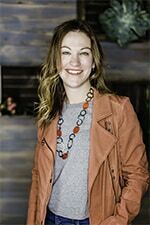 – I’m excited for the end of the school year and all that May brings with it. Including Cinco de Mayo, which in my book means all the Mexican food your heart desires. To celebrate, I’m bringing these Turtle Churro Nachos to the proverbial table. My love of nachos is strong and well documented. Recently I’ve shared these Chicken Reuben Sheet Pan Nachos and my Huevos Rancheros Sheet Pan Nachos. Nachos make me happy, plain and simple. So I figured, why not make DESSERT nachos. I’m betting I’m not going to hear any complaints about this one! In fact, the ooohs and ahhs coming from our dining room table as I served these to my children solidified my cool mom status. Well, for the 15 minutes they were eating them anyway. These Turtle Churro Nachos are a true crowd pleaser. Homemade cinnamon and sugar speckled tortilla chips are drizzled with caramel sauce and my Microwave Chocolate Ganache before being crowned with a dollop of caramel cream cheese. They’re then sprinkled with chopped pecans and additional cinnamon sugar. Make a large platter and gather around the table to eat them together or set everything out as a dessert buffet and let everyone make their own. I love that you can make each component ahead of time so that when it’s dessert time, you simply have to assemble these churro nachos. If you’re looking for other churro inspired treats, I’ve got my eye on these Pumpkin Churro Cheesecake Bars, Red Velvet Churros and Churros with Mexican Chocolate Dip. 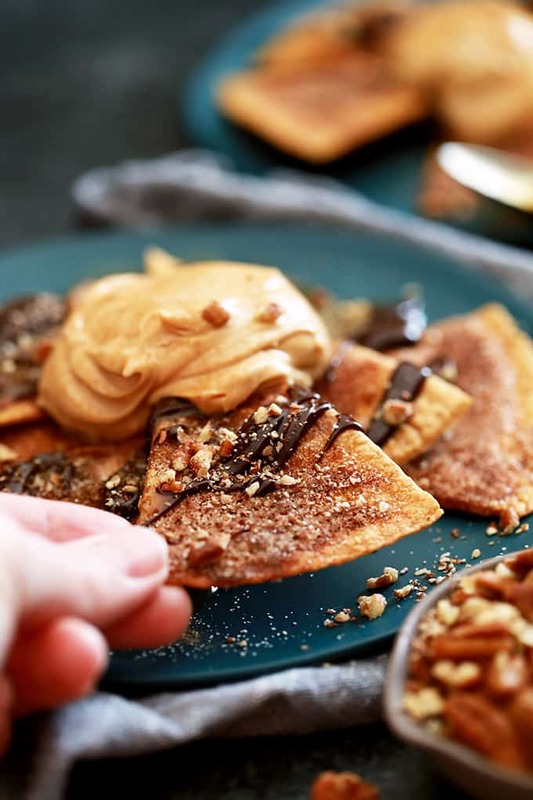 Making the homemade cinnamon and sugar tortilla chips that act as the delicious base for these Turtle Churro Nachos is so incredibly easy. With a pizza cutter, cut a stack of burrito sized tortillas into quarters. 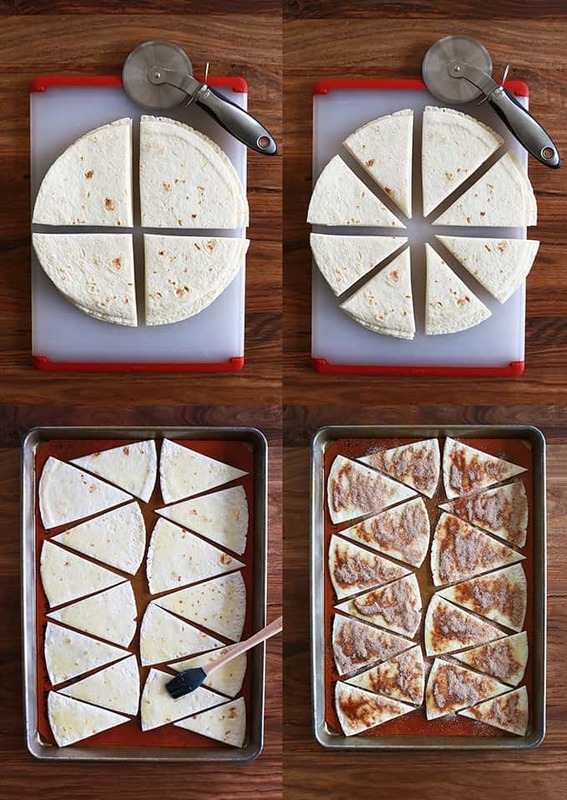 Then, cut the quarters in half to create eight triangles from each tortilla. The tortilla triangles are then arranged on a silicone mat or parchment lined baking sheet and brushed with butter. They’re then showered with cinnamon and sugar before heading to the oven to crisp. That’s all there is to it! I mean, look at these beauties! Put this new found knowledge in your back pocket as this is a great way to use up any leftover tortillas you have hanging out in your pantry. I’m hoping I’m not the only one who has rouge tortillas hanging out in their pantry! These sweet tortilla chips are also a fun lunchbox treat if you have little ones at home. My menagerie loved finding a few leftover chips in their boxes last week. And that dollop of deliciousness that tops these Turtle Churro Nachos? Oh yeah, that’s the caramel cream cheese that’s also spiked with cinnamon and sugar. It’s also the easiest component of this recipe thanks to Robert Rothschild Farm’s Caramel Cheese Ball & Dessert Mix. Into a small bowl goes softened cream cheese, the cheese ball mix, cinnamon and sugar. In just a minute or so, an electric mixer has whipped everything together into pure creamy goodness. This sweet and buttery dessert mix is downright addictive – I’m thinking I need to stock up for summer get togethers as it would make the perfect dip for anything from fresh fruit to cookies and crackers. Cut tortillas in quarters and then cut the quarters in half. Arrange on silicone mat or parchment lined baking sheets. Brush butter over tops of tortilla triangles. In a small bowl, stir together sugar and cinnamon. 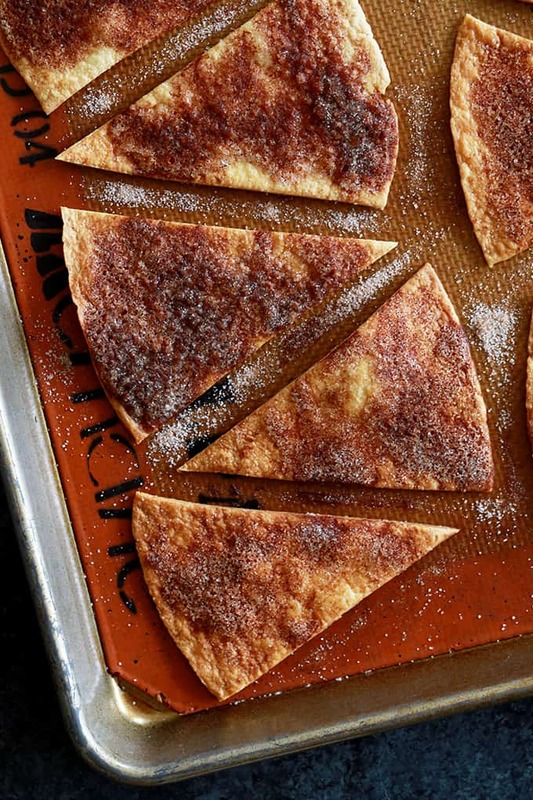 Sprinkle over tortilla triangles. Bake for 18-20 minutes or until sugar is melted and tortillas are crisp. Meanwhile, in a small bowl add cream cheese, Robert Rothschild Farm Caramel Cheese Ball & Dessert Mix and two tablespoons of cinnamon sugar mix. Using an electric mixer, cream together until smooth. To serve nachos, arrange churro chips on a plate. Drizzle with chocolate ganache and caramel. Top with a dollop of caramel cream cheese mixture. Garnish with chopped pecans and additional cinnamon sugar mixture, if desired. This recipe was written in partnership with Robert Rothschild Farm. As always, all thoughts and opinions are my own. Thank you for supporting this brand that allows me the opportunity to create content for Melanie Makes. omg - best nachos ever! 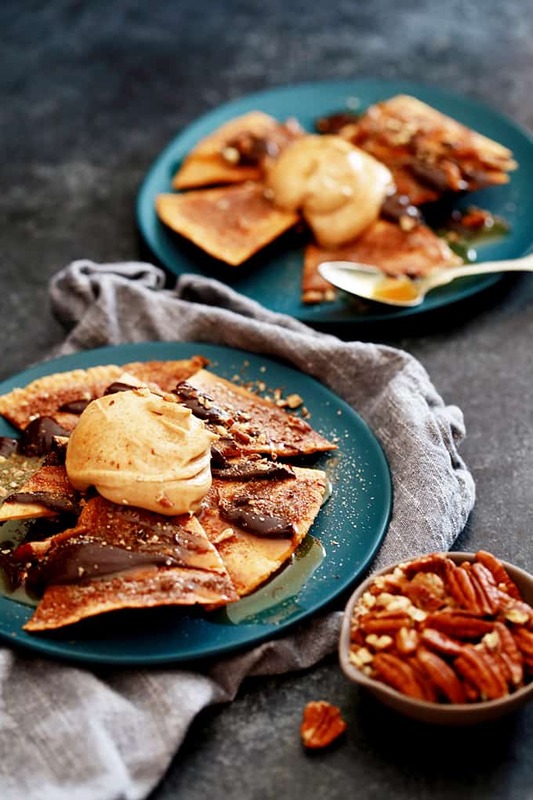 Dessert + nachos = winning! Ohmygosh I am drooling all over my keyboard!!! This looks phenomenal! Thanks, Cathy - so appreciate it! So simple and so amazingly delicious! I want to try this!!!! This is absolutely amaazing!! My family would LOVE this!! I am loving the idea of a dessert nacho! So creative! GIRL I am going to drive over to your house and demand that you make these for me STAT. Absolutely. Brilliant. This dessert recipe is crazy-brilliant! A combination of so many really, really good things all mixed up into one (even good-er!) thing! So great that it's perfect for feeding a crowd, too - a total showstopper for any party! Yes, everything good in one delicious dessert! Thanks so much, Carrian - appreciate your kind words! What a delicious idea for a fun treat! I could eat a whole plate of these nachos!